Summary: The new novel from the New York Times bestselling author of The Devil Wears Prada and Revenge Wears Prada—a dishy tell-all about a beautiful tennis prodigy who, after changing coaches, suddenly makes headlines on and off the court. 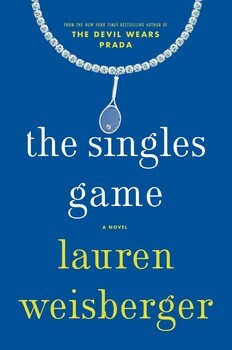 How appropriate is it that today is the release day for the new novel THE SINGLES GAME by Lauren Weisberger? I spent much of my weekend watching some great tennis at Wimbledon, and I was totally in a "tennis" mindset. It probably helped that I had recently finished reading the entertaining book THE SINGLES GAME. I am so in the mood to grab my racket and hit a few balls around with someone! THE SINGLES GAME tells the story of a sweet and fairly innocent tennis star named Charlie Silver. She has a reputation for being a clean-cut girl with her ribbon woven braid, but the best she's ever been ranked is 23 in the world. Not too bad but she definitely wants more! When she injures herself at Wimbledon one year, she disappears from the tennis world for a few months. In that time, Charlie decides to reinvent herself. She fires her long-time coach (and good friend) and hires a killer coach who won't allow her to touch her much-loved coffee. And that's just the beginning, Feltner gets Charlie a stylist, has her attend the in-parties, signs her up to participate in celebrity matches, has her eat only healthy foods (no carbs! ), and makes increase her practice schedule. He even arranges for Charlie to stay in hotel rooms near the hottest male tennis player in the world. Charlie returns to the world of tennis as a "Warrior Princess." Gone is the sweet braid and in its place are Svarokski crystal mini tiaras and an all black wardrobe. Her tennis has also improved under Coach Feltner! As Charlie moves up the tennis ranks, she realizes that the "new" Charlie isn't without drawbacks. She begins to lose sight of what's really important in her life like friends and her father, and she has to face whether being the number one tennis player in the world is worth it! I found THE SINGLES GAME to be a very fun book, and I do think summer is the perfect time to read it. I love that the release was so close to the action at Wimbledon, and I honestly have found myself more interested in tennis than I have been for years. As I watched the tennis matches over the weekend, I couldn't help but think of the "other" side of tennis -- what goes on off the court. Charlie was a fantastic character! Of course, I loved Charlie before her injury and redesign; and I didn't want her to change. However, I could also understand why she wanted to go all-in on a sport that she had dedicated her life to... at the expense of almost everything. It was fairly predictable that Charlie's rebirth would come with some negatives, and I certainly hoped that she would make the "right" decisions by the end of the novel. Another fun part of THE SINGLES GAME was the relationship Charlie ended up having with Marco, the number one male tennis player in the world. They were both beautiful and, needless to say, the press went wild with their off-court relationship. It was a fun story, and although it wasn't entirely unpredictable, I think this romance will appeal to many readers looking for a fun summer romp! Finally, I loved getting an insider's look at the world of tennis. I'm far from athletic, but tennis was one sport that I did play as a kid. For years, I have always been interested in these athletes both on and off the court. I've followed the lives of many tennis players, and I've even read a few biographies and memories about these athletes. So THE SINGLES GAME and its portrayal of the glamorous (and often times not-so-glamorous) world was so fun! It was full of juicy gossip and I bet much of it resembles the real world. I definitely recommend THE SINGLES GAME to fans of tennis but also to readers who are looking for a fun summer read! I used to play a lot of tennis but never on that level, obviously. Still, I know the tennis world can be cutthroat. This book sounds soooo good to me. This is high on my list! Glad it's so good.